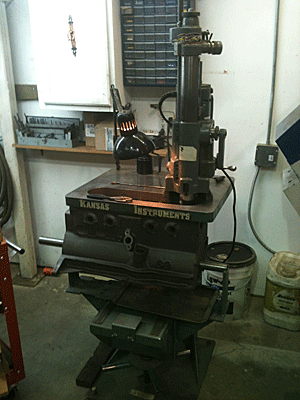 Our Peterson PK447-S boring bar is mounted on a Kingston boring table for fast and efficient performance. Torque/Honing plates for big and small block Chevy, big and small block Dodge, big and small block Ford, Buick nailhead. When you finish your cylinders with a torque plate, your engine break in period is significantly reduced because your cylinders are no longe subjected to the distortion created by head bolts. We finish every bore with a "Plateau Hone", this further breaks down the peaks left by honing, which also contributes to a better, faster break in. Out of round connecting rods are able to be accuratly rebuilt using our Sunnen 1699 rod and pin hone. Our rod hone is supported by a Sunnen Rod Heater and a Sunnen Cap Grinder.